Colombian firm Interbolsa is being liquidated in a move to protect the interests of Colombia’s financial markets. This after an announcement last Thursday that Interbolsa is facing liquidity shortages. Regulators intervened the following day when the brokerage firm failed to make a $11 million payment to a local bank, according to Reuters. Of note here is Interbolsa’s list of principal investors (see chart below). Topping the list is Mansarovar Energy Colombia Ltd., a company formed in a unique union of Chinese (Sinopec) and Indian (ONGC Videsh) financing, and which represents 24 percent of activity in Colombia’s heavy crude sector. According to the chart below, Mansarovar holds an 11.61 percent stake in Interbolsa. Research firm Hydrocarbons Colombia calculates that Mansarovar’s holdings have an approximate book value of US$7.5 million, but that this amount is not material to either parent company, meaning little in the way of operating consequences for Mansarovar. Nor, they suggest, will there be much pressure in Chinese or Indian home markets to explain the company’s actions. Though bound to lose millions in the Interbolsa fallout, Mansarovar is a growing presence in Colombia. The company received approval from local partner Ecopetrol in April 2012 for the commercialization of the UnderRiver II field in the Magdalena Medio. This field is expected to allow Mansarovar produce 40,000 bpd in the second half of 2012, which will amount to an increase of 10 percent in total production. Mansarovar announced more recently that it received permission to also develop the Abarco Phase II, Under River Fase III and Moriche Phase III fields. Hydrocarbons Colombia estimates these new fields will add 13,000 bpd to Mansarovar’s current production. China’s engagement with Colombia, though now expanding considerably, is still a fairly new phenomenon. China’s entrepreneurial presence in Colombia is just now taking shape, with only 40 Chinese companies currently based in Colombia. Among these are giants Sinopec (Mansarovar’s parent company), Sinochem, Huawei and Sinohyrdro. As Latin America’s fourth largest economy, Colombia boasts a high investment grade, macroeconomic stability, private property protection mechanisms, and strong institutions, but China still invests strikingly little in the Colombian economy – only $32 million over the past ten years. To encourage additional investment on the part of Chinese entities, Colombia initiated a bilateral investment treaty (BIT) with China in 2008, which took effect in July of 2012. 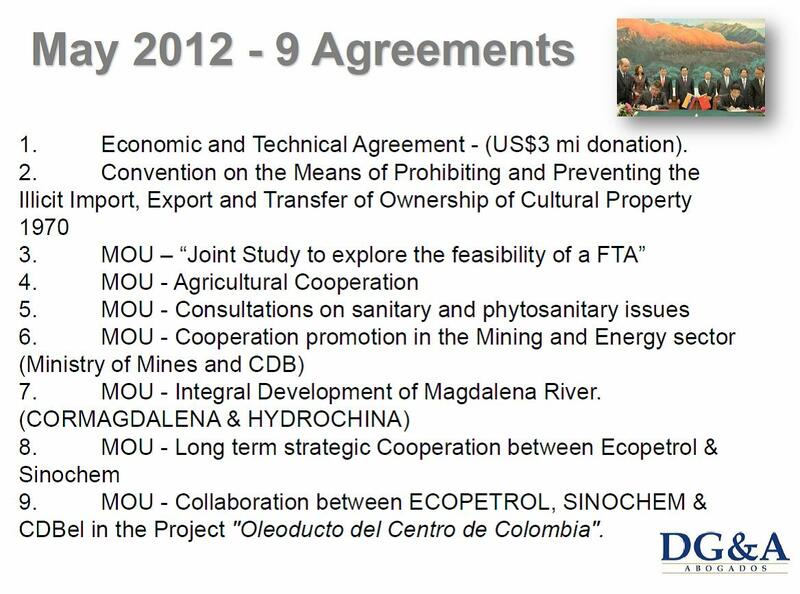 A series of MOU’s signed in May of 2012 by Chinese President Hu Jintao and Colombian President Juan Manuel Santos (see PPT slide below) established a framework for future engagement and cooperation between China and Colombia. Highlights from Santos’s trip to Beijing include a pipeline project that will carry Venezuelan, Colombian, and possibly even Ecuadorian crude to Colombia’s Pacific coast, Sinohydro-supported Magdalena river development, and a feasibility study for a China-Colombia free trade agreement.